People who are looking for a high degree of surveillance for their business or any other property, The GWSecurity-32CH400WHD 24 cameras package is a perfect choice. This camera package provides the best indoor and outdoor security services that will suit for any scenario. The security cameras in this package are 24 in number and are advanced, weatherproof and suitable for both indoor and outdoor security. It has a VGA DVR system for monitoring and 32 channel HDMI. The remarkable features of GWSecurity-32CH400WHD 24 cameras system can be split into groups. The characteristics of the 24 security cameras. In order to make the users familiarize with the monitoring and the camera system, a guide is provided along with the purchase of GW Security System. The 32 Channel DVR has a 4TB hard drive that is already installed, PTZ control and a USB backup. It is easy to organize remote viewing with the application present for various mobile devices like iPhones, Android, iPad and many more. If any suspicious activities are detected by the security camera, it will immediately notify the users via email alerts. This is possible due to the configuration of motion-activated sensors that can detect suspicious activities. The security cameras that are used outdoor can also be used as indoor security cameras. The cameras are tensile and weatherproof as it is coated with metal. If the security cameras are positioned in an elevated place, they can be avoided from any damage as they will not grab any unwanted attention. With the help of the 1000 TVL line resolution, each GW Security System offers high-resolution imaging. The user can adjust the view angle with the help of the manual zoom Varifocal lens (2.8mm – 12mm) which is inbuilt. The system of 64PCS IR LED integrated into every device attributes to the remarkable feature of 147-foot night vision. How the GWSecurity-32CH400WHD 24 cameras have an edge over its competitors? The GW Security System face negligent competition from its peers, especially when comparing to the quality features of GWSecurity-32CH400WHD 24 cameras surveillance segment. One of the competitors Lorex makes a home protection package of 24 cameras that has less characteristic, yet a lot cheaper. GW Security additionally provides a surveillance framework with 16 security cameras that function outdoor being almost indistinguishable to the cameras that accompany the 32CH400WHD 24 cameras frameworks. The 16 camera package is best suited for top quality outdoor and indoor security cameras rather than the 24 devices. The 32 channel DVR has a preinstalled 4TB hard drive. This has a huge storage and is good for recording and storing the image data. The installation procedure of the indoor and outdoor security cameras is much easier nowadays than it was in the past. It is very important to decide the positioning of the cameras and check if it requires any setting up of power cables or adapters. The DVR and the monitor also have to be positioned properly. However, many users who have the security camera for the home install the monitor remotely. Commitments are honored: It is the generally pleasant experience to realize that reliable and reputed organizations will stand for their commitments and make sure that the product shall deliver all the functionalities as what has been offered at the selling point of time. The GWSecurity-32CH400WHD 24 cameras package is supported by one year guarantee, and free lifetime online and telephone GW Security client and technical support. High-quality video feeds: Very high-quality video feeds are ensured inside and outside the house/office by the GW Security System that is supported by color Sony CMOS units by 1000 TV lines. One can capture the exact views one needs by adjusting the view angle. This is possible due to the presence of 2.8mm – 12mm Manual Varifocal lens. With the help of the button control in the ODS menu, the security camera can be easily maneuvered for zooming in and out to get quality digital images. Perfect motion detectors: Once configured, the motion detector present in the system allows the user to receive alerts via email instantaneously whenever a suspicious action occurs. One can view the images remotely using a mobile phone. Numerous free applications can be downloaded to help you for supporting the remote view. Shipping terms: Not all territories are covered by a free shipping terms. Since this is a big surveillance security system, customers are requested to check the fine print of the shipping and delivery terms. Some territories could be exempted due to heavy delivery costs and hence make sure that your delivery point is covered as per the GW Security System delivery terms. On an average the security camera system has 4.6 stars out of 5 stars and 67 percentage customers support the product with full 5-star compliments. The consumers who use The GWSecurity-32CH400WHD 24 cameras System are always satisfied with its astonishing features and quality output. There are many cheaper security systems available on the market with less quality and features. However, if a person is very keen on quality and remarkable features, The GW Security-32CH400WHD 24 cameras System is the best choice. Although this system needs high capital, it is totally worth every penny spent on it. 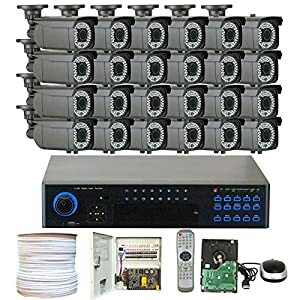 The GW SECURITY Camera comes complete with 24 camera and 4 TB of local storage? That qualifies as heavy even from security cameras. Perfect for workplaces and large homes. I was at a loss with what my options were. I spend a good 3 weeks reading reviews on your site and my boyfriend and I finally settled on GW Security. We have had our system for a week and I am in love with it! It is easier than I would have expected to use and we both feel safer in our new home. We moved out of state and don’t know anyone around here.